Why use a diesel fuel supplement? Because the fuel has changed! I have been advised by several people I trust, that the new low sulfur diesel, mandated by the feds, has a significantly reduced lubricity. The fuel pumps, at the fuel stations, are now tagged with either a warning that the pump is dispensing the old fuel, which will damage the new ('07) engines, or that the pump is dispensing the new low sulfur fuel ( which I am assured by people I trust), will damage the old engines! Sounds like a typical government enterprise don't it! Anyway the deal is this. In trying to improve the pollution numbers from diesel fuel, they radically reduced the lubricity of the fuel. That is one of the major reasons diesel engines last so long. The fuel itself lubricates the engine. There is a solution. That is to start religiously using a quality fuel supplement to replace the lost lubricity and protect your injector pump and injectors. (the parts most vulnerable to the lost fuel lubricity) Religiously in this case means every fillup! It will add a couple bucks to the cost of a fillup. But considering the cost of potential repairs it's a cost I am willing to pay. A couple dollars now for diesel fuel supplement, or a couple thousand later to fix a broke truck! I use the Howes fuel supplement brand. Another brand that has been recommended to me as a quality product is called Lucas fuel supplement. However, I have also been told it is less reliably available for some reason not made clear to me. I myself have had some difficulty finding the Lucas brand. I am sure there are also other, quality fuel supplements. The important thing, I believe, is to start routinely using a good lubrication supplement. A problem is, how do you measure out the correct amount and store the diesel fuel supplement between fillups, without a lot of mess, stink and hassle? Here's my solution. I went to my local REI store and bought several (5) , 11 oz.fuel bottles. Built by MSR, they were designed to hold backpacking stove fuel. 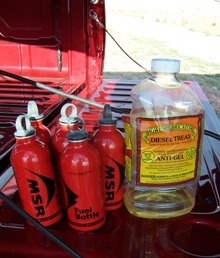 I take the 1/2 gallon Howes diesel fuel supplement bottle and divide the contents up between the multiple MSR stove fuel bottles. I try to refuel at the 22 gallon point. Howes recommends 1 oz. of supplement for every 2 gallons of fuel. So 11 ounces in the bottle treats 22 gallons. Pretty neat right? I tell you, I'm one quick puppy! All I have to do is pull out one of the prepared, tightly sealed fuel bottles, dump the contents into the tank, fuel up and wa la ............. I'm in good shape! One thing. You cannot "over treat" your fuel with this, so absolute precision is not necessary. Erring on the side of a little extra treatment is not a bad thing. The guys I've talked to have testified to me that they virtually eliminated fuel pump problems in the past using these diesel fuel supplements. That was with the old fuel. Now as they have changed the fuel the last couple years it has only gotten worse. Protect yourself and your engine, supplement it! I since found a reliable source for the LUCAS brand supplement, and have been using it for most of a year. The cost has proven to be negligible! I buy it in gallon jugs, and then divide it out into my MSR fuel bottles.